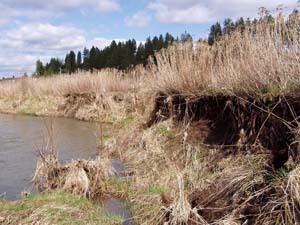 In cooperation with the Latah Soil and Water Conservation District, PCEI completed the Deep Creek Riparian Restoration Project. 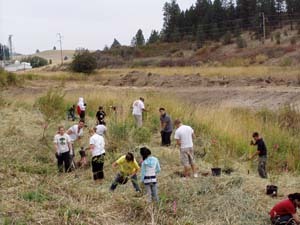 PCEI’s restoration project was one part of a larger, inclusive watershed-wide project aimed at addressing watershed priorities and goals of the Palouse Tributaries Total Maximum Daily Load (TMDL) developed by the Palouse Tributaries Watershed Advisory Group. 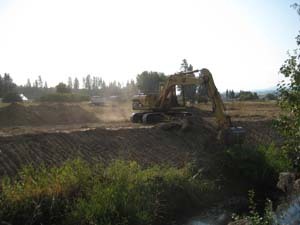 Potlatch Corporation, Idaho Department of Lands, University of Idaho and North Latah County Highway District were also partners on the Palouse River Water Quality Improvement Project funded by 319 Nonpoint Source Management grant. Each organization focused on different Best Management Practices (BMPs). 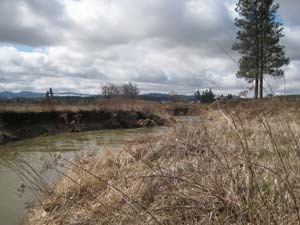 PCEI’s focus was on riparian restoration. Restoration work took place on private property in the lower Deep Creek Watershed. Restoration work was designed to reduce sediment, bacteria, nutrients and temperature, pollutants for which the TMDL on Deep Creek was established. 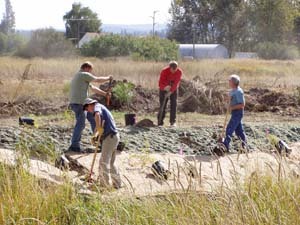 In addition, this project will improve riparian habitat. According to the TMDL, sediment loading to Deep Creek is 30 times greater than background levels and 11 times greater than the estimated load capacity, requiring a 96% load reduction in sediment. Average Cover Condition Class for Upper and Lower Deep Creek segments was classified as ‘poor’ as a result of the potential natural vegetation cover (PNV) analysis used to establish the temperature TMDL. This ‘poor’ classification signifies the largest differential between PNV and existing cover (-70.2 % average), which is assumed to cause the most heating to the stream. The stabilization and revegetation of 1,070 feet of creek will reduce in-stream erosion. Bank stabilization techniques included resloping and erosion control fabric installation. The estimated 22,500 square feet variable riparian buffer was planted with native woody, herbaceous and grass species. The riparian buffer will act as a filter reducing overland sediment flows, while filtering nutrients and bacteria generated from upland land use practices. In addition to acting as a filter for pollutants, the established riparian buffer will also provide shade reducing extreme summer temperatures. Two wetlands were also created to help filter overland flows that flow through the landowners horse pasture. These wetlands will help reduce nutrient and bacteria from entering Deep Creek. Prior to restoration activities, the stream banks of Deep Creek were steep and eroding. Native vegetation exists in small patches along the banks. Canary reedgrass (Phalaris arundinacea L.) is the dominant vegetation within the riparian area. Land use practices in the watershed have altered the flow regime. The channel is incised and in many locations stream channel connectivity has been modified. Pre-Restoration (August 2008): Taken just prior to excavation, this photo also emphasizes the eroded and often vertical banks. A noticeable deficit of native trees, shrubs and grasses is also evident. 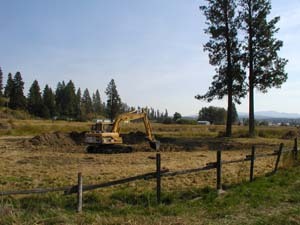 Wetland Excavation (September 2008): The existing wetland upstream was enhanced and two new wetlands downstream were created! Hydroseeding (September 2008): After excavation was complete the banks were sprayed with a hydroseed mixture of native grasses. 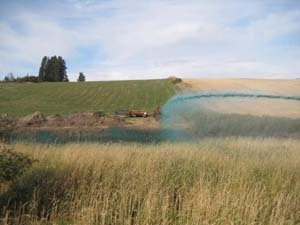 The function of the brightly colored hydroseed base is three-fold: it helps stop bank erosion, it protects and holds the grass seed in place, and it retains the moisture needed for seed growth. Washington State University (WSU) Volunteer Event (September 2008): Twenty-five volunteers from the International Student Club and a Restoration Ecology class from WSU teamed up to plant over 90 native trees and shrubs. With that much “volunteer-power” it took less than two hours to get all of the plants in the ground! Blue Tube Construction (September 2008): Gwen Jooris (on left), a PCEI volunteer, along with several other volunteers helped piece together blue-tube sheets and bamboo poles. The completed blue-tubes were then secured around the newly planted trees and shrubs to help protect them from damage. Greening the Banks (September 2008): John Adler, the landowner, and Len Zeoli, a WSU professor, volunteered their time to work along side the Watershed Crew and help plant native trees and shrubs along the re-sloped bank.